Once there lived a trader by name Dhanapal. He was a very rich merchant. However he was very greedy and miserly. He never donated even a paise for the poor and the needy. He never bothered about the sufferings of the helpless. Nor did he spend his money for his own enjoyment, for it would be spent. He always treasured his wealth more than his life. It is the nature of Lakshmi to keep moving from one place to another. She never stays permanently at a single place. This is why today’s pauper turns tomorow’s prince and vice versa. Poverty or prosperity is never permanent. Hence donate and do dharma when you have money. That Danapala became very poor all of a sudden. His wife, sons, relatives and the Government usurped all his wealth and left him penniless. He tried to start various other businesses but failed in all his attempts. His relatives started cursing him. They alone are respected who are wealthy. They alone live happily who are wealthy. A poor man is called a dull head and a wealthy man a wise one. Respect comes from wealth. Hence Danapal, now poor lost all his respect. He approached his purohit for advice. This purohith narrated a story. 1) Those who are unrighteous and never donate. 2) Those who gamble, drink wine, torture animals and engage in prostitution. 6) Those who are envious of others. 14) Those who hate devotees of the Lord. The Lord then asks, “ where do you prefer to reside permanently? 11) There is no ridicule or crying. The trader did so, begot prosperity. This time he became wise He donated lots in charity. Thus those who worship the Lord here will get back their prosperity. Lakshmi preffered to stay permanently at this place since all were engaged in Dana and Dharma. 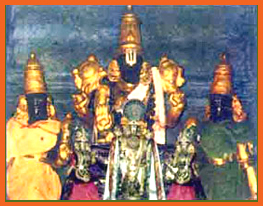 Hene this kshetra came to be called “ Thiru- Nindra- vur, the place where Lakshmi preferred to stay once and for all. AS IN THIS MONTH VARALAKSHMI VRATHA IS CELEBRATED--THIS KSHETRA HAS BEEN POSTED.